"2012 will always be remembered as the year I lost the man who taught me so much about sports and life." I cannot remember the moment that I fell in love with sports. My memories of childhood are filled with either playing or watching sports. But I can tell you about who taught me to love sports. My dad. He spent hours teaching me different sports - from riding a bike to shooting a layup to skiing down a mountain - the same as he did for each of my seven siblings before me. In high school, we would watch Minnesota Twins game after Minnesota Twins game, always with the television muted and the radio on, as he taught me the intricacies of the game of baseball. I learned to see the game by just listening to the radio. As my dad taught me to love sports, he also taught me important life lessons. Practice may not make perfect but it always makes you better. And, if you want something, you need to prove you truly want it by putting in the time and the effort. My dad was always a bit doubtful that I could make a living as a photographer. We would sit down regularly to discuss the state of the industry and I would show him new data on median wages nationally and locally. He tried to sway me toward a different path when the going got tough. But I was stubborn, just like my dad. I had found a career that brought me joy and happiness just by picking up a camera and never planned to let it go. Words escape me as to how amazing it was to feel the pride in my dad’s voice the day I called my parents to tell them I was hired as the photography intern for the 2006 Minnesota Twins. A pride I felt again first hand as I walked away from the organization in 2008 to pursue freelancing and again with each new contract I signed. My dad, while cautiously optimistic about my career choice, was my biggest supporter. He collected every one of my newspaper and magazine clippings. And he would let me know which players to focus on for upcoming games. 2012 will always be remembered as the year I lost the man who taught me so much about sports and life. 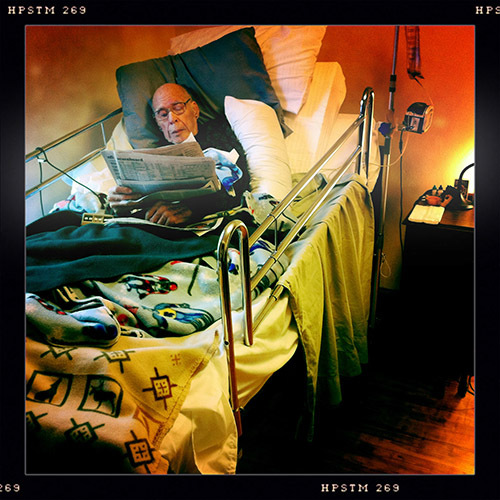 My dad became ill in November of 2011 at the age of 89. During the two and half months until his death in January, he required around the clock care provided mainly by my mother and myself. My assignments to cover the Minnesota Vikings, Wild and Gopher men’s basketball became a chance to escape the reality of the inevitable. It was a chance to be closer to him while I could feel him slipping further away. In April, I covered Opening Day for the Minnesota Twins. It is a blur of mixed emotions. The happiness I experience with a camera in my hand, documenting a game I love, was still there. But I knew I wouldn’t be able to swing by my parents’ home on the way home from the ballpark and share my images with my dad. We wouldn’t be able to discuss Joe Mauer’s batting average, CJ Wilson’s leg kick or the relief pitcher my dad thought should have stayed in the game longer. I was lost. As the year progressed, work became easier. It began to not be work, but a chance to learn and grow. I began to see a change in my photography. I pushed myself harder to see differently. I practiced, not to make perfect but to make better. I put in more time and effort and I saw more reward. I applied all of the lessons my dad taught me and I made me proud of what I accomplished. And I know if I’m happy and proud, my dad is ecstatic. Hannah Foslien is a freelance photographer based in Minnesota. Samples of Hannah’s work can be viewed at her SportsShooter.com member page: http://www.sportsshooter.com/members.html?id=5950.